Hot Water Heaters - Our Water Heater Services In San Jose | Cupertino Plumbing, Inc. Waiting for hot water from your shower, tub, or sink means wasting the water running through your system in the meantime. This can waste thousands of gallons of water each year, while heating incoming cold water from your water main to replace the water lost can raise your home’s energy costs. A hot water recirculating system is an excellent solution to conserve both energy and water — at Cupertino Plumbing, our plumbing service near San Jose, CA, are dedicated to providing cutting-edge plumbing solutions to help you reduce your monthly water costs and eliminate the daily inconvenience. A hot water circulating system is designed to reduce the amount of time it takes for you to get hot water from any tap, while also recycling water, rather than letting it go to waste. When your hot water tap is closed, water is left inside the line until you open it again. The farther that tap is from your water heater, the longer the line and the more water is stored inside it. This water cools off over time, which is why you don’t immediately get hot water when you open the tap. A hot water circulating system activates any time you open any hot water tap in your home by pumping hot water quickly through the pipe to the tap. The pressure reduces the amount of time you wait for hot water; additionally, the system recycles the water currently in the line by pumping it back into your water heater, rather than letting it go down the drain. This reduces water waste and can even minimize the amount of energy your water heater uses to heat your home’s water by taking advantage of the water’s residual heat. 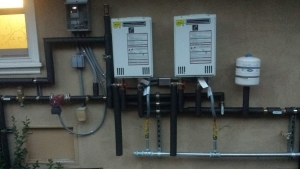 Your plumber can help you design your hot water circulating system to best meet your needs. You can reach an experienced plumber near San Jose, CA when you contacting Cupertino Plumbing or calling us at (408) 600-2768 to discuss plumbing service, repair, and maintenance for your home. Hot water circulating systems can run 24/7, meaning the system will activate any time you open a hot water tap, night or day. You can opt to add a timer to your hot water circulating system, allowing the system to shut off during low use times of day, such as overnight while you’re asleep. Hot water circulating systems can also include a water temperature sensor, which activates the system only when the water left in the pipe drops to a certain temperature. You can even include a “request” button to activate the system only when you want it, or only at certain taps in your home. Our plumbing experts at Cupertino Plumbing can help install a hot water circulating system in your home! If you have any questions about these systems, contact us to learn more!